The Chinese economy must be getting out of control, because the Chinese government is doing the unthinkable: It is desperately trying to put the brakes on the economy. When you pump a stimulus package that represents 14% of GDP through a fire hose into an economy, which was already on shaky bubble foundation, in a very short time you’ll have some serious unintended consequences -- you’ll get super bubbles. To understand what's taking place in China today, we need to rewind the clock about a decade. At that time the Chinese government chose a policy of growth at any cost. To achieve that, it kept its currency (the renminbi) at artificially low levels against the dollar -- this helped already cheap Chinese-made goods become even cheaper than its competitors’. The US and global consumers were eager to buy them. China turned into a significant exporter to the US. Normally, if free-market economic forces were at work, the renminbi would have appreciated and the US dollar would have declined. However, if China let its currency appreciate, its exports would have become more expensive and the demand for Chinese products would have declined, and its economy wouldn't have grown at 10% a year. But China isn't your local democracy, and it needed to grow at any cost. So instead, through the government-controlled banking system, China accumulated a couple trillion dollars of foreign reserves in US dollars and euros. This had an unintended consequence: It helped keep US interest rates at very low levels, and lent a friendly hand in the financing of a huge consumption binge by the US consumer (i.e., China’s largest customer). The more China sold to the US, the more dollars it accumulated, and thus the more US Treasuries it bought, driving our interest rates down. The US consumer was in turn happy to leverage its future (through the “always” appreciating asset, its house) and delighted to consume cheap Chinese-made goods. (I'm not dismissing the role in what took place of many other factors, like lack of financial regulation; missteps by rating agencies, the Fed, and politicians; securitization; etc., but I don’t want to steal the spotlight from China). This symbiotic match made in heaven between China and the US consumer worked great as long as housing prices kept rising and the financial machine kept multiplying dollars. But all good things come to an end, and great things come to an end with a bang. The financial meltdown erupted upon us, the US and global banks started dropping like flies … well, you know how that story played out. So now let’s fast forward a year. Today the global economy is stabilizing, thanks to Uncle Sam and various other “uncles” around the world. But the consumers of Chinese-made goods are overleveraged and now deleveraging, unemployment is high, the banks have got religion and aren't lending, and there's not much demand for loans anyway (except from the US government). Despite this, the Chinese export-based economy, a manufacturer to the world, has clocked growth of 8.7% in 2009. The rest of the world looks at the Chinese growth miracle with envy; it seems that China has got economics figured out. But don’t hurry to trade your democracy for an authoritarian system. The Chinese grass is not as green as it appears. First, China lies. One shouldn't believe all the economic numbers that are put out by the Chinese government. This is the government that magically managed to report 6% to 8% GDP growth in the midst of the financial crisis, when its exports were down more than 25%, tonnage of goods shipped through its railroads was down by double digits, and its electricity consumption was falling like a rock. It's hard to manufacture 8% more widgets with a lot less electricity, and no, China didn't suddenly become energy-efficient during the financial crisis: Electricity consumption rebounded in a few months once the stimulus kicked in. Despite reported rosy GDP growth, the Chinese economy was contracting during the economic crisis. But don’t be surprised, this is a government that will go to great lengths to maintain appearances to keep its ideology going. 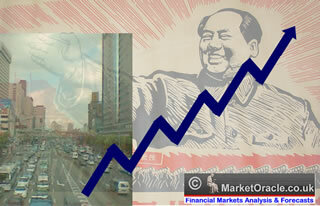 Second, China will do anything to grow its economy, as the alternatives will lead to political unrest. A lot of peasants moved to the cities in search of higher-paying jobs during the go-go times. Because China lacks the social safety net of the developed world, unemployed people aren't just inconvenienced by the loss of their jobs, they starve (this explains the high savings rate in China) and hungry people don’t complain, they riot. Once you look at what's taking place in the Chinese economy through that lens, the decisions of its leaders start making sense, or at least become understandable. Unlike Western democracies, where central banks can pump a lot of money into the financial system but can't force banks to lend or consumers and corporations to spend, China can achieve both at lightning speed. The Chinese government controls the banks, thus it can make them lend, and it can force state-owned enterprises (one-third of the economy) to borrow and to spend. Also, because the rule of law and human and property rights are nascent in its economic and political system, China can spend infrastructure project money very fast -- if a school is in the way of a road the government wants to build, it becomes a casualty for the greater good. China has spent a tremendous amount of money on infrastructure over last decade and there are definitely long-term benefits to having better highways, fast railroads, more hospitals, etc. But government is horrible at allocating large amounts of capital, especially at the speed it was done in China. Political decisions (driven by the goal of full employment) are often uneconomical, and corruption and cronyism result in projects that destroy value. Infrastructure and real estate projects are where you get your biggest bang for the buck if your goal is to maintain employment, because they require a lot of unskilled labor; and this is where in the past a lot of Chinese money was spent. This also explains why, in 2009, new floor space constructed was up 100% and residential real estate prices surged 25%. And this explains why they keep building skyscrapers even though the adjacent ones are still vacant. To make things worse, before the financial crisis and enormous stimulus, China was already suffering from what I call late-stage-growth obesity, inefficiencies that are a byproduct of high growth rates sustained for a long period of time. Though Chinese growth in the past was high, in its late stages the quality of growth has been low. For example, in an echo of past Chinese government asset-allocation decisions, China built the largest shopping mall in the world, the South China Mall, which is 99% vacant years after construction. China also built a whole city, Ordos, in Inner Mongolia, on spec for one million residents who never appeared. The inefficiencies are also evident in industrial overcapacity. According to Pivot Capital, Chinese excess capacity in cement is greater than the combined consumption by the US, Japan, and India combined. Also, Chinese idle production of steel is greater than the production capacity of Japan and South Korea combined. Similarly disturbing statistics are true for many other industrial commodities. The enormous stimulus amplified problems that already existed to financial-crisis levels. China is a less shiny but more drastic version of Dubai. There is speculation that the Chinese consumer will pick up the demand slack for the US and European consumers who are deleveraging and buying fewer Chinese-made goods. This may happen, but it will take decades. The US and European consumers are two-thirds of much larger economies. The Chinese consumer is only one-third of the Chinese economy, and its purchasing power is significantly undermined by the undervalued renminbi. We look at China and are mesmerized by its 1.3 billion people, its achievements of the last decade, its recent economic resiliency, and its ability to achieve spectacular results on the fly. But we have to remember that economic bubbles are usually just a good thing taken too far. This was the case with railroads in the US in the late 19th century: The railroads were supposed to change the landscape of the US, and they did, but that didn't prevent a lot of them from going out of business first and investors losing money. The Internet was supposed to change how we communicate, and it did, but in the process it generated a tremendous bubble, followed by the loss of wealth for many. The Chinese economy is no exception. Its long-term future may be bright, but in the short run we’ve got a bubble on our hands. Everyone wants a shortcut to greatness, but there isn’t one. It would be great if the word (economic) cycle only existed in a singular form, and the only cycle we had in the economy was happy expansion. If there were no cycles, there would be no painful recessions. But as heaven couldn't exist without hell, or capitalism without failure, economic expansion can't exist without recession. China has been trying to bend the laws of economics for awhile, and with the control it exerts over its economy it may seem, at least for a short while, that the laws of economics work differently in China. But this is only a temporary mirage, which must be followed by huge pain and drastic consequences. No, there's no shortcut to greatness, in anything, not in politics, not in personal life, not in economics. P.S. The last paragraph on "shortcuts to greatness" doesn't just apply to China (though China, through much greater control of its economy, took it to a new level); it applies to the US, Europe, and Japan as well. Over the last several decades our respective governments intervened in free markets and actively tried to manage the business cycle – only expansions, or just mild recessions – and for this we are paying today. More articles on China can be found here.